Last year we had our first visit to In The Night Garden Live at Richmond Park and I have to say it was an absolutely magical experience. With this in mind I did wonder if we attended again we would still get that wow factor. This year we were lucky enough to have two trips to the huge snow dome as we had been asked along to experience the Meet A Character and try out the goody bag which is something we hadn’t tried the year before. I went along with Oscar the day before opening and had the pleasure of meeting Upsy Daisy and our favourite Iggle Piggle. The rooms are set up so that you have your own individual experience and the surprise is so much greater then the usual ‘meet and greets’ as it is all done in a separate room for your own personal experience. The minute the curtain went back Oscar’s eyes filled with delight and he ran straight in for a big hug! Over the moon at the chance to meet his favourite characters we then went and collected our goodie bag to try out. For those of you that read my blog you will know that I am not a fan of merchandise at events such as this as it is usually massively over priced and broken before we even get though the show. In The Night Garden Live however offers a huge goodie bag full of treats from the usual light up toys to cuddly toys and cutlery sets. It come at a hugely discounted price compared to buying the gifts separately and there is a whole host of keepsakes that will keep those memories of your trip alive for a long time to come. The next day we headed back to the snow dome with my husband and Frankie and although the boys were a year older the magic of the snow dome captivated them as soon as we entered the theatre. Their favourite characters took to the stage in the form of puppets and costumes actors and the whole dome was filled with laughter from the pre school audience. I’m always a sucker when it comes to sights such as this as there is nothing better than seeing the delight on little ones faces from the sheer delight of what they are experiencing. If you are looking for a show to introduce your children to the wonders of the theatre then this is the perfect place to start. The whole area is geared up for little ones with a huge buggy park, food warming facilities, plenty of toilets and changing facilities and of course their favourite characters coming to life in front of their very eyes. *we were given tickets to the show and souvenirs of the trip for the purpose of this review. 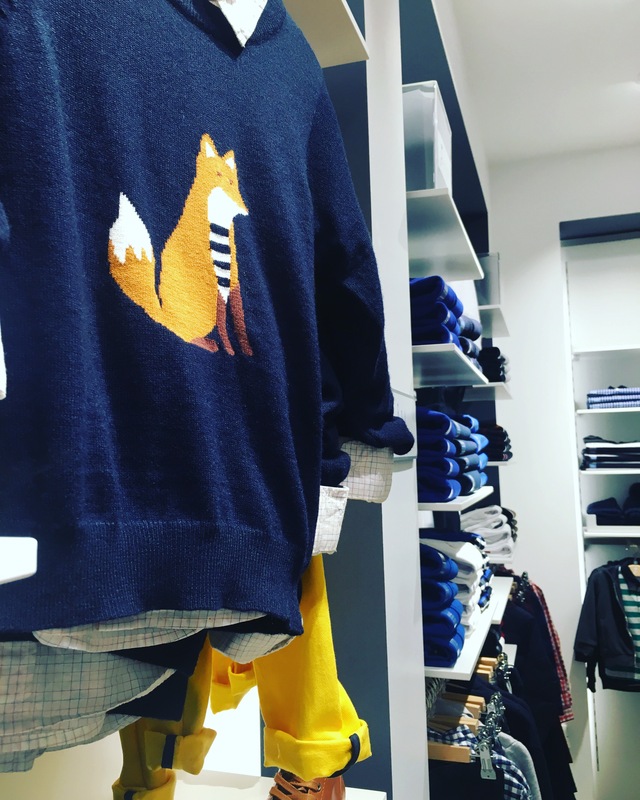 Last year I was introduced to the children’s clothes brand Jacadi at their Hampstead branch and was immediately taken by their traditional, timeless classic pieces that are made to perfection. The brand has gone from strength to strength since hitting the UK and a brand new store has just opened in Richmond that we went to check out last night. I decided to have a bit of quality time with number three who was more than happy to join me and see what they had to offer. The store was a little ones dream with a Charlie And The Chocolate Factory theme complete with chocolate fountains, big sticky lollies and a real life Umpa Lumpa! It was at this point I was extremely pleased that I hadn’t got the little ones as there is no way I would have been able to keep their chocolate covered fingers away from the beautiful clothes! The stores collection was as stunning as I had expected. For the boys their were beautiful soft knits that could be teamed perfectly with smart shirts and tailored trousers. For the girls their were cute dresses and matching cardigans in bright colours that are always welcome at this time of year. The section that always catches my eye though is for the really tiny ones. I like babies in outfits that are firstly made for comfort as well as looking good and this is what Jacadi have down to a tee. Jacadi falls into the upper price bracket of children’s clothing but they really are items that are made to last and with their classic designs could be passed down through the family for years to come without aging at all. I know that I would be super happy to find a little blue gift box for any of my little ones under the tree this Christmas. *I was supplied with a gift token for attending this event and they are all my own, honest opinions.